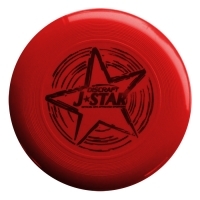 The official youth disc of the Ultimate Players Association is the Discraft J*Star 145 gram Ultimate Disc. Just like its big brother the Ultra-Star, but smaller and lighter. Designed for youth Ultimate leagues, with the same quality, performance and consistency you've come to expect from Discraft. A great catch disc too!